That’s another Dancing engagement! Dancing With the Stars pros Val Chmerkovskiy and Jenna Johnson are getting married, they announced on Thursday, June 14. 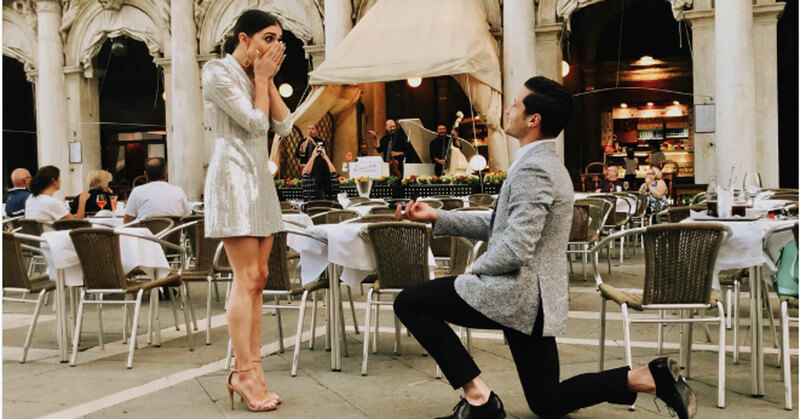 Both Johnson and Chmerkovskiy took to social media to post photos from the romantic proposal in Italy. “I knew the moment I met you, you were the man of my dreams and I wanted to be with you forever,” Johnson wrote alongside photos of her boyfriend popping the question. Chmerkovskiy proposed in the romantic destination of Venice, while the two were dining al fresco. In the background he had prepared a string quartet, and both, of course, were dressed to the nines for the special moment. “I can’t wait to make you my wife,” he added on Twitter. The engagement news comes just one year after Chmerkovskiy’s brother, Maksim, married another DWTS pro, Peta Murgatroyd, in a three-day wedding spectacle in Long Island and New York City last summer. Like Johnson and her new fiance, dancer Cheryl Burke is also engaged. Burke announced her engagement to Matthew Lawrence in early May. This is what you get for trying to take a cute pic while the @cavs are in overtime…. Be the first to comment on "‘Dancing With the Stars’ Pros Val Chmerkovskiy and Jenna Johnson Are Engaged: See His Romantic Proposal"